A co-director of the South Korean animated film "Underdog," said Saturday that he is disappointed at the weaker-than-expected public attention to his brainchild produced after seven years of painstaking efforts. "I just feel distressed. I've realized the high wall of prejudice against Korean feature animations," said Oh Sung-yoon in a telephone conversation with Yonhap News Agency. The film, jointly directed with Lee Chun-baek for a period of seven years, was released Jan. 16 but has so far drawn only about 180,000 viewers. The performance is dwarfed by their previous animated film titled "Leafie, a Hen into the Wild," which sold more than 2.2 million tickets in 2011. "Underdog" tells the story of Moongchi, a pet dog who is abandoned and goes on an adventure on the streets to find true freedom and happiness with other stray dogs. It was praised as a masterpiece with picturesque drawings, distinctive 3-D characters, solid drama and social messages. Singer-actor D.O., or Do Kyung-soo, a member of the popular K-pop boy band EXO, provided the voice for Moongchi. Oh's latest film faces much fiercer competition on the road this winter due to the releases of a number of imported animated films, such as "Spider-Man: Into the Spider-Verse," "Ralph Breaks the Internet," "The Grinch" and "How to Train Your Dragon 3." Underdog," produced at a cost of 3.3 billion won (US$2.96 million), may be no competition for the imported animations, but Oh was convinced of its cinematic quality. "Public confidence in Korean feature animations appears to have fallen, while foreign animated films have been more favored by viewers. If they are released at the same time, viewers seem to choose imported films. Breaking the wall of prejudice is a lonely and tough fight," Oh said. Oh said he didn't expect the low audience turnout, as there are about 10 million pet owners in South Korea. "Some joked that 'Underdog' will draw at least 1 million viewers, or 10 percent of the 10 million domestic pet owners. Pet owners seem to fear excessive sadness in the film. But please pay more attention, as the film reflects a perspective seen from abandoned dogs." 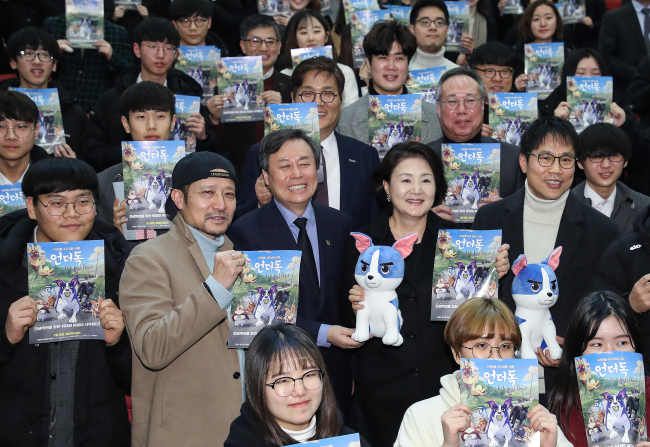 First lady Kim Jung-sook visited a Seoul cinema Tuesday to watch "Underdog," possibly lending a momentum to its lagging ticket sales. Oh said a failure of his film will further dim the outlook for investments in the production of Korean feature animations. "Underdog" has been exported to 69 foreign countries, including the United States, France and Canada, and invited to compete in the Tokyo Anime Award Festival set to open March 8. The film won the best animation award at the Silk Road International Film Festival in China in October.